What is the getting-ready process like? 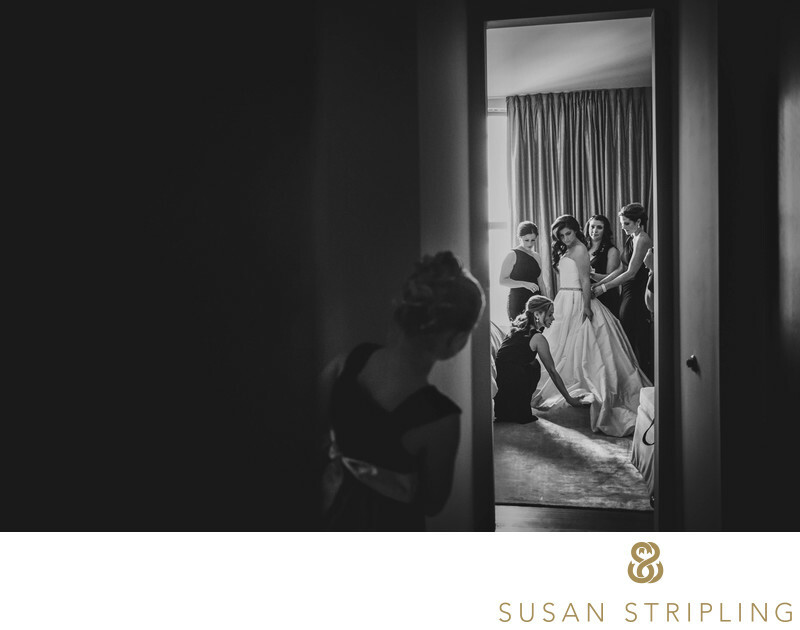 The getting-ready time is one of my favorites on a wedding day. 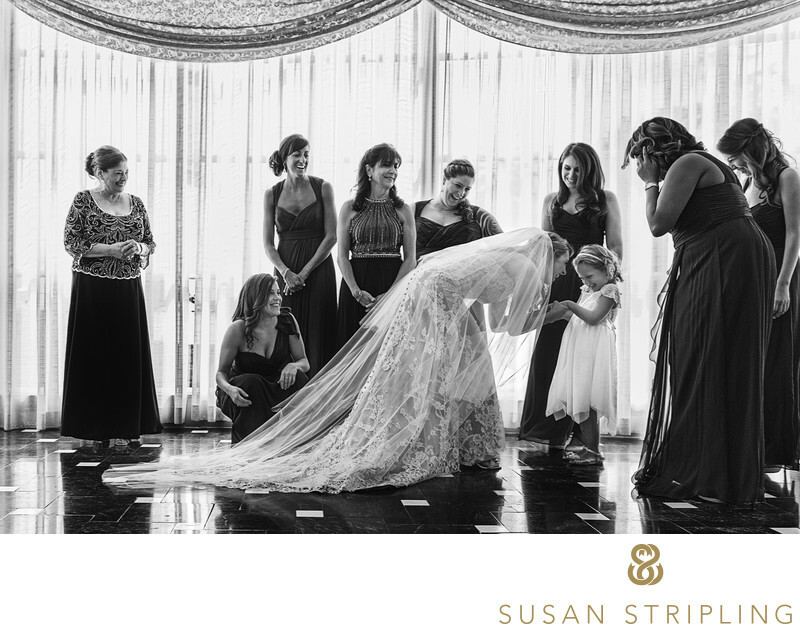 This is when the couple gets ready, separately or together, surrounded by their family, friends, and bridal party. No two weddings are the same, and no two preparation processes will look similar. I might find myself at a wedding where a bride gets ready with fifteen bridesmaids, her mother, and all of her female family members. The next weekend I could be at an event where a bride gets ready with just her sister and a treasured best friend. Two brides could be getting ready across the hall from each other, or in separate spaces entirely. A groom could be flying solo, surrounded by groomsmen, or just hanging out with his parents. Two grooms could choose to get ready together.However you choose to get ready on your wedding day is absolutely your decision. There are a few things to consider, which we’ll get to shortly! What will be photographed at this time? During the getting-ready time, I’ll be photographing a handful of different things. I usually start out with your wedding day details. This includes your engagement ring, your wedding band, and your future spouse’s wedding band. I’ll photograph your attire, wedding dress, shoes, and anything else that is small and personal to you. This happens quickly and efficiently, freeing me up to begin documenting the actual getting-ready process. I know that wedding blogs really like to emphasize the importance of the “detail shots”, but I promise that creating these detail images won’t take up too much of your day! It’s most important to me that I document the relationships and moments, not just the details. What do we need to be doing at this time? What should you be doing? Having fun! Please don’t worry about the photography at all, that’s my job! My goal here is to document. You won’t be heavily posed or moved into unnatural scenarios. My style is very documentary and editorial in nature, meaning that the moments you see in my online portfolio are real moments. I want this for you and your wedding photographs. My goal is for you to look back and see real moments, not staged ones! If you two are getting ready separately (as most do), we need to allot time in the timeline for both to be documented. This is also something that most clients and I talk about extensively before the wedding. If the wedding includes a groom and a bride, does the groom want coverage at all? As much as the bride? If it’s the wedding of two women, do both women want equal coverage? If it’s the wedding of two men, the same question will arise. Where will you both be getting ready? When we talk about the timeline, we’ll go over these logistics to make sure that everyone receives ample coverage! Don’t worry about trying to figure it out yourself, I can help you as much or as little as you need in terms of finalizing your timeline. Here are just a few tips to make this part of the day run as smoothly as possible! In terms of timing, it would be great if this part of the day could take up sixty to ninety minutes of the timeline. This would allow me ample time to document the process without you feeling rushed in any way. If you’re considering where to get ready, I suggest both of you being in the same venue or hotel. It makes getting-ready images a lot easier and more efficient when we don’t have to change or move in between locations. We can make almost any scenario work, but if you have the ability to all be in the same building or venue, that would be amazing. 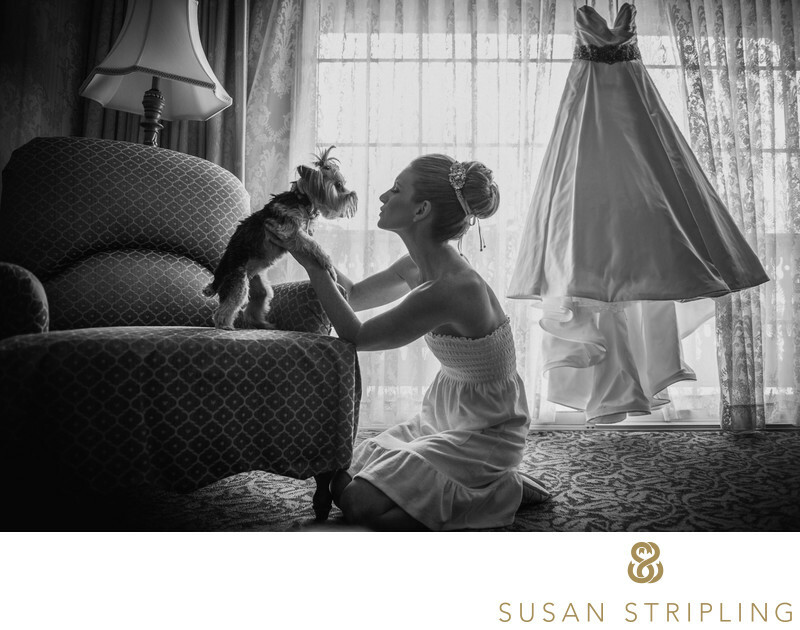 If you’d like images with all of your wedding rings together, arrange to have them all in the getting-ready room. This makes it easier to take pictures of them, since we won’t have to go back and forth between rooms to round up all of the rings. When putting together your timeline, please allot time to actually get dressed. This can take anywhere from five minutes to half an hour or more, if you have a complicated dress! During your last fitting, take note of how long it takes to get fully dressed. Add a bit more time onto that for anything last minute, as well as jewelry and shoes, and this gives you a good idea of how much time you’ll need. 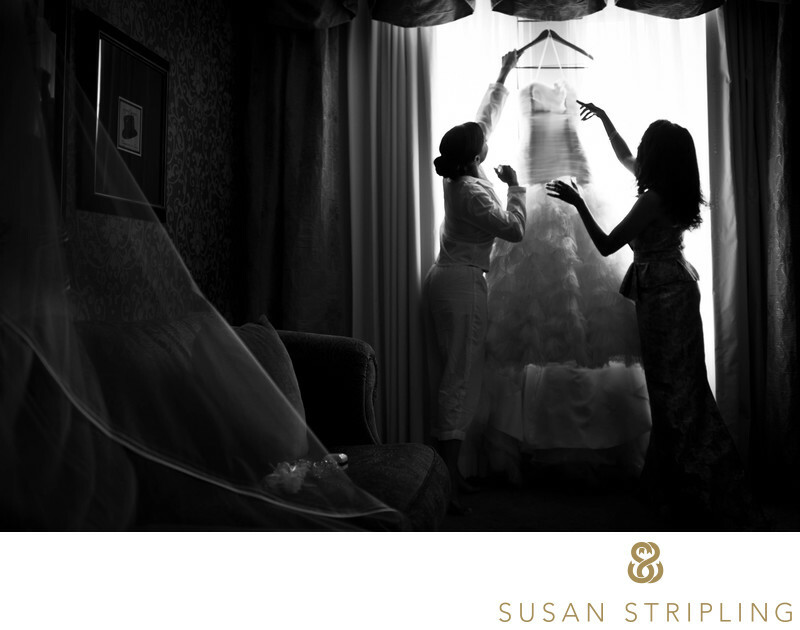 If your mother, bridesmaids, or other family members will be helping you get ready, let’s get them dressed first! About fifteen minutes to half an hour before you want to put your dress on, they’ll need to get themselves ready. That way they’ll be ready to help you when it’s your turn to get dressed! If you have videographers, I’d love to talk to them before the wedding day. I have worked with many amazing cinematographers who cover the day in the same way that I do. I have also shown up to weddings only to find a team of five videographers staging moments and scenarios in the getting-ready room. I’d love to be as close to on the same page as possible so that we are each able to get the images and film that you have commissioned us to do! If you're exchanging gifts, let's designate a time to do that. It would be amazing if your hair and makeup were done, or you were just about ready to get dressed. We can even document this once you're dressed. I'd love to hear what you have planned, so that we can choose the best time for it to occur! Please don’t be the last one to get hair and makeup done. Many stylists recommend keeping the bride as the last person styled, but if anything runs late, you need to be done before that! I highly suggest padding the hair and makeup timing by fifteen minutes to half an hour, just in case. Most of the time when the day runs late, it’s because something in the hair/makeup process has fallen behind. Weddings have lots of moving pieces, and I’d love to see us set up for success at the very start of the day! It would be wonderful if you could consider the room you’ll be getting dressed in. If you’re getting your hair and makeup done in a crowded space or conference-style room, it would be super helpful to be able to move to another room to get ready. In my ideal scenario, I’d be looking for a room with a lovely window and some open space where you can stand. If we’re in a hotel, we can use another room in your suite from where you have your hair and makeup done. If we’re in a conference room, perhaps we could go back to your hotel room to get dressed. If you’re unsure about the room you’ve chosen, I’d be more than thrilled to help you out! Just give me a call or drop me an email and we can discuss the logistics as much as you’d like! This might seem like a lot, but don’t let it be a source of stress! If you have any questions, please don’t hesitate to contact me. All of these tips and suggestions are just meant to help keep your day as smooth and easy as possible, and I’d love to chat more about your thoughts!